Yesterday we ventured out to Springvale, it was awesome! I have only been there a few times which is so exciting for me as it means that I still have heaps to discover. I finally worked out that Springvale is divided into two sections, one Vietnamese and one Thai, again awesome! We didn't really have any agenda, it was just an excuse to get in the car and see what we could find. I had kind of planned to check out one of the Thai restaurants but other than that is was just a see what happens kind of mission. We arrived at around 10:30 and wandered around checking out the great seafood and in particular the massive Queensland mud crabs looked fantastic as did the pippies, sand crabs and silver whiting fillets. We didn't have much for breakfast and quickly got hungry, as we thought it was a bit early for lunch we decided to try some yum cha at the Gold Leaf. We found our way upstairs just as the doors opened at 11 which was perfect. We sipped on some Chinese tea, watched the carts roll around and picked a few delicious dumplings and other things and our little snack quickly turned into something bigger and we both decided lunch was not required. After eating we headed over to the Thai section as I wanted to buy a tea sock and some Thai tea so I could make Cha Yen (Thai iced tea). While looking for the Tea in the first Thai grocer I found one of my holy grail items, a cast iron 28 hole kanom krok pan! It was $35 which I thought was great as I would probably have paid $50 I wanted one so badly. These are mostly used for Kanom Kok but i reckon they are also suitable for Banh Khot and we also had a delicious mussel Banh Khot style meal at the Nang Loeng market in Bangkok that I am also keen to try and replicate. I digress a bit but the photos of it are below. Of course it was fantastic, how could you go wrong with crunchy batter mini pancake and a plump mussel and some sriracha on the side. I also found my Thai tea and tea sock at the same place so things were going great. Next we headed across the carpark to all the Thai Video stores and other grocers and bought a few pre-made meals and desserts that I'll write about in a separate post. Now back to the Kanom Krok. 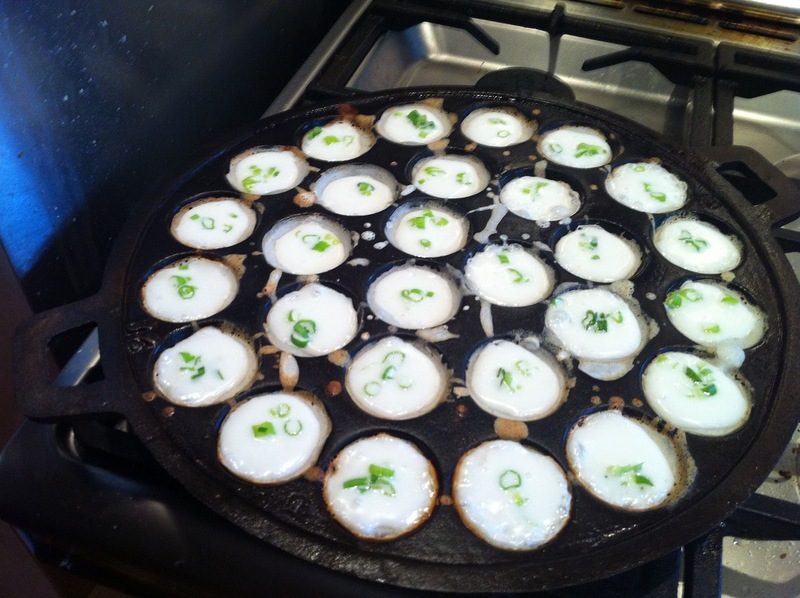 Armed with my new pan I decided to cook Kanom Krok for breakfast. I have now learned how to use google translate to type Thai words and the use google to search for Thai websites which google then translates into English. Usually the translations aren't great but sometimes they are good enough to get a pretty good idea of ingredients and quantities. I did this with Kanom Krok (ชนมครก) and came up with a pretty good recipe from bloggang.com, use this link to an English translation. The recipe process was a bit dodgy but I just used the ingredient list and combined it with the recipe from David Thompson's Thai Street Food. Its a pretty simple process of making a batter, you just mix the rice flour with some water until you forma smooth paste. This is then blended with the cooked rice, fresh grated coconut, salt, coconut cream and water until smooth. DT also uses a really interesting ingredient, Limestone paste which is dissolved in water then the dissolved liquid is added to the batter to add crispiness. I haven't seen this ingredient mentioned in any other cookbooks but you really can't question DT when it comes to Thai food. 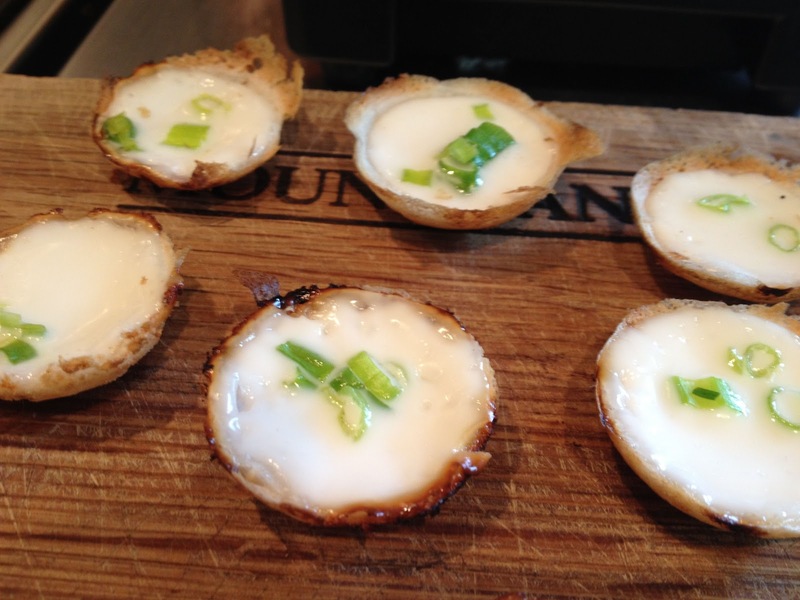 My Kanom Krok turned out deliciously crispy so I'm certainly not going to argue with him. I think the Limestone paste comes in red too and the red one is also used to mix with betel nuts when they are chewed. This is the process that gives those elderly asian women the deep ruby coloured teeth that you sometimes see. 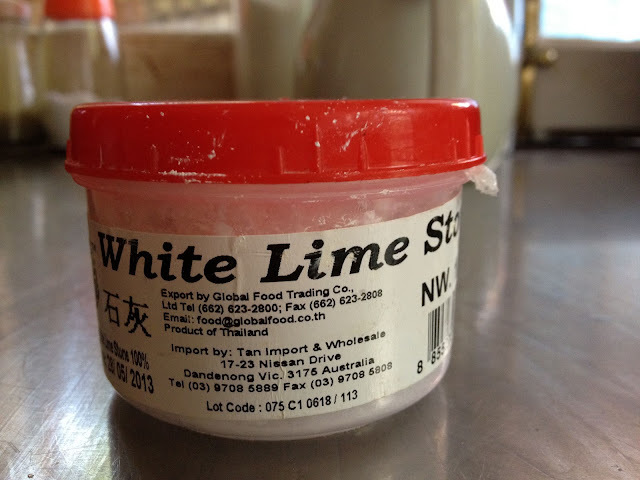 I'm not 100% certain which colour Limestone paste is used for which process but I don't think it really matters. I used the white one and had no problems with it. After the batter is made you need to make the sweet coconut cream filling. This is also very easy, 1 cup of coconut cream is mixed with 3 or 4 tbs of sugar and a pinch of salt and then stirred until dissolved. 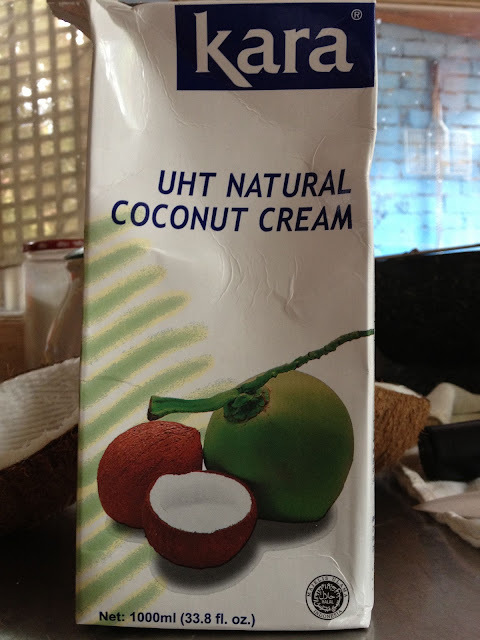 As a rule I try and avoid any canned coconut milk or coconut cream products. If I have to go canned I will choose Chakoah brand. If I can get it, Kara brand is my favourite coconut cream. I find that its very creamy with a constant consistency and no metallic taste that you sometime get with the canned products. I have tried to make my own coconut cream and while I enjoyed the process the cream wasn't as thick and rich as you get with the Kara brand so when it comes to making desserts that's what I use. So here's a few pictures of the process. 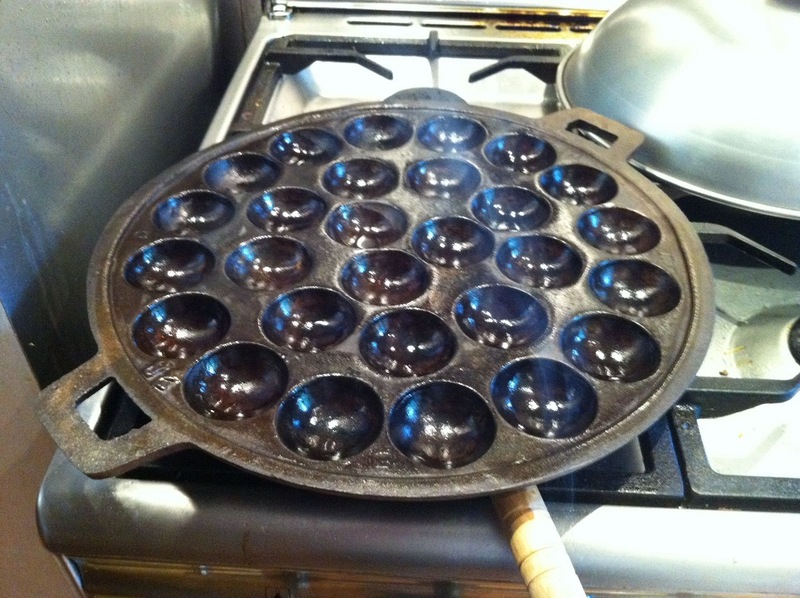 Before I started, I seasoned the Kanom Kok pan by adding a spoonful of coconut oil into each mould and cooking it over a high heat while rubbing the oil over the pan with some paper towel until the smoking stopped. I repeated this process a few times until I was happy that the pan had sealed nicely and had turned a lovely smoky black colour. When the pan is nicely heated you just pour in the batter into each mould until about half full then put the lid on for a few minutes. Make sure the heat is not direct on the plate, I use a diffuser. Then add about a tablespoon of the coconut cream sugar mix and put the lid on again for a few minutes, then sprinkle a few sliced spring onions on each mould and put the lid back on again. My tip with making sure the Kanom Krok come out of the pan easily is to make sure each mould is well greased with coconut oil and importantly make sure that the edges are nice and brown, that way you know the bottom is cooked and with a sharp knife you can gently break the seal around the edges and then use a metal chinese soup spoon to gently prise the Kanom Krok from the mould. Some come out easier than others but I was extremely happy with this batch, it was my second effort. Notice the nice brown crispy edges, according to David Thompson this is due to the Limestone paste. 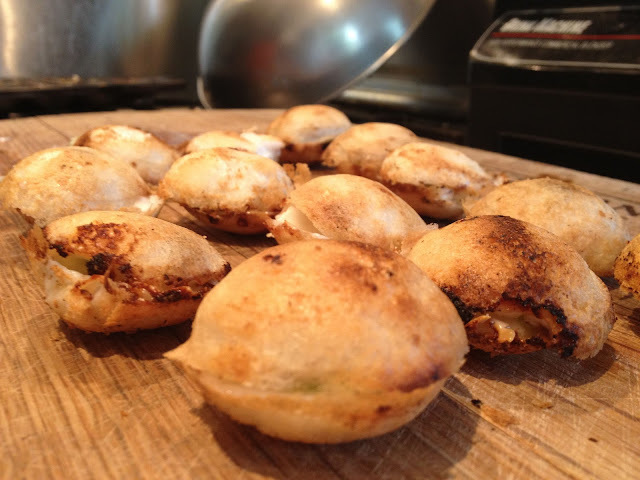 Put them on top of each other to form delicious crispy domes and let them cool. 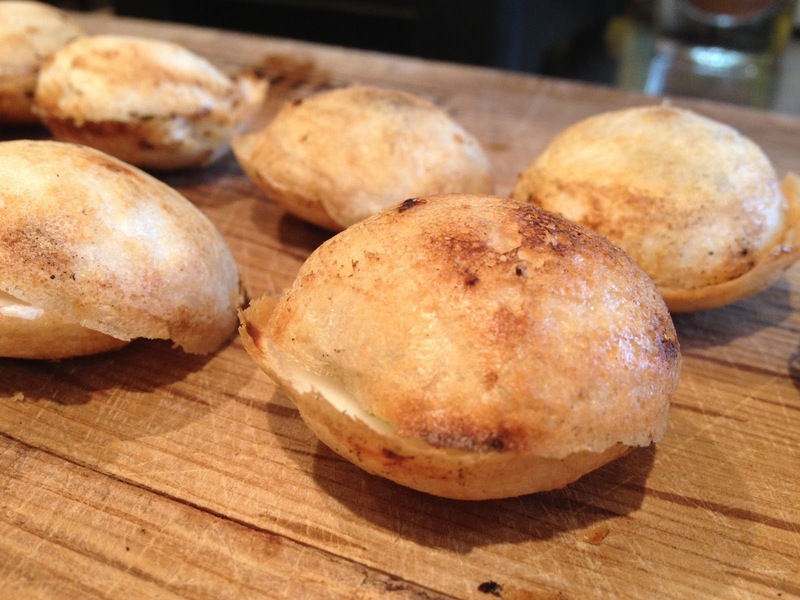 If you get excited and eat them too soon the centre is still molten hot and will cause obvious mouth burning pain! Once they have cooled you know the deal, devour them one by one until the plate is empty! These lasted a matter of seconds. 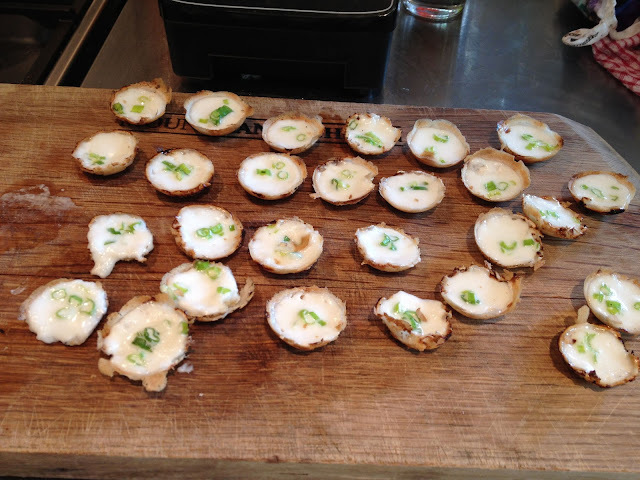 My approach is to throw them down whole, the taste sensation is not really like anything else I can think of. 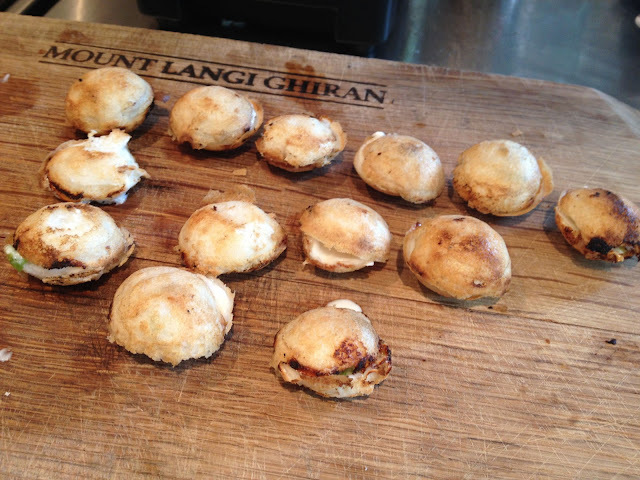 The lovely crispy outer shell yields to a smooth sweet creamy almost custardy coconut filling. What a great way to start the day, it sure beats muesli for breakfast! 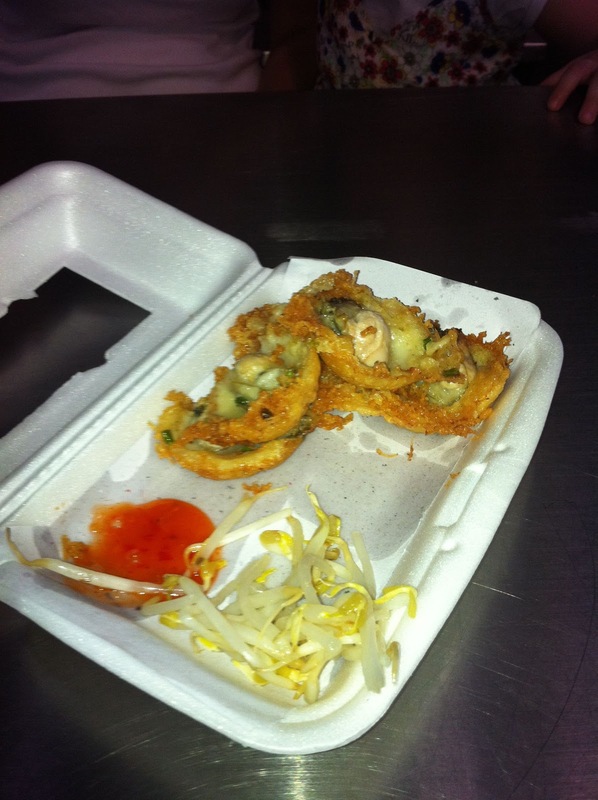 Thankyou for your comment, you are right they were delicious! I will be cooking Kanom Krok again tomorrow morning for breakfast and this time I'll take note of the detailed measurements and update my original post. You'll have to wait a couple more sleeps but I promise it will be worth it! hi just wondering where you bought this pan from? I can't remember the name of the Thai grocer but it was in Springvale and the grocer is in the carpark section which has mostly Thai shops. By looking at google maps it is two or three shops to the right of Larb Cafe. 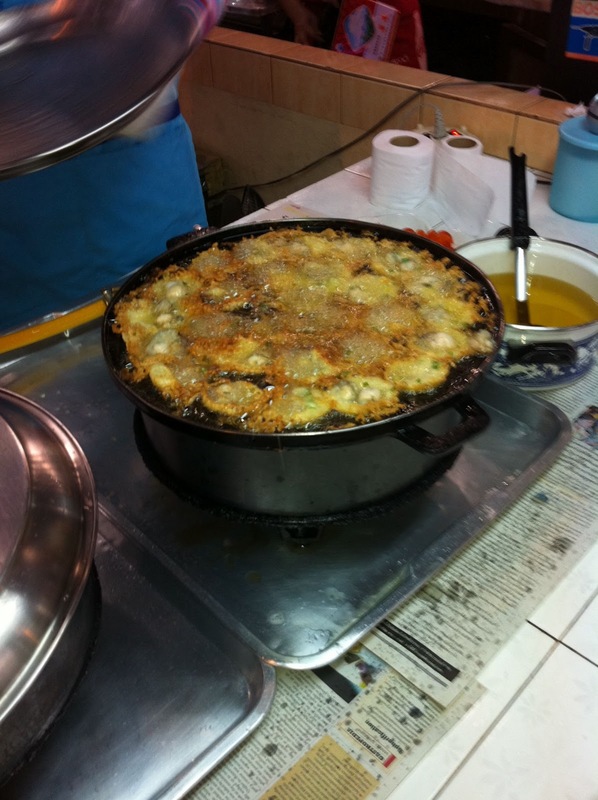 Unfortunately I didn't see any other Kanom Krok pans there when I bought mine but hopefully you will get lucky. Please let me know how you go as I don't get to Springvale that often and my Mum has asked me to get her one too. This follow up post contains all my measurements.